More information about how a calibrator works in this link. 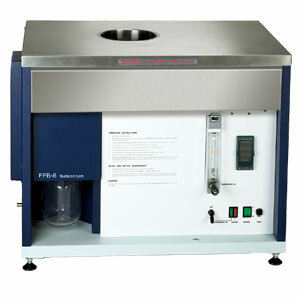 The FFB-8 is a precision fluidized bath, with exceptional temperature stability and uniformity, which make them the ideal choice for critical temperature sensor calibration and heat treatment processes. FFB-8 fluidized (sand) bath has become the market standard for carrying out shape setting (heat treatment processing) of metals including Nitinol and platinum for medical device manufacturing. This unit is suitable for many other applications, including thermal testing of sensitive components such as semiconductor devices, wire products, delicate transducers and may also be used as a constant temperature environment for chemical reactions. Because the fluidized bed is a fine, dry powder, it does not have surface tension effects of liquid baths and will not wet any immersed components. The electrical insulating properties of the alumina used in the FFB-8 are not affected by fluidization making. * The dead bed mode of operation is entered by shutting off air and power to the unit. The system reaches a state of thermal equilibrium after the bath media collapses and stability is better than ±0.010°C for a period of 3 to 6 minutes. This allows for precise comparison calibration of temperature sensors in the bath.